A meeting of Africa’s leading cassava breeders zeroed in on actions needed to stop the rapid spread of cassava brown streak disease (CBSD). The resurgent crop disease has already caused a low-grade famine in northern Mozambique , and led farmers in Zanzibar to largely abandon cultivation of the critical food crop. Breeders from Uganda , Kenya , Tanzania , Malawi and Mozambique all noted the rising threat of the disease to small-scale farmers in their areas. Cassava breeders at the meeting in Zanzibar 3-5 October 2007 said that the disease has recently spiked, for reasons that are unclear. Yet, breeders have already developed a number of disease-resistant varieties, and others are in the pipeline. Breeders noted that the problem lies in getting these varieties to farmers and that many African governments have stringent variety release rules that seriously delay getting the new varieties into farmers’ fields. The African Cassava Breeders Network meeting brought together nearly 50 people from eight countries: Kenya , Uganda , Tanzania , Mozambique , Nigeria , Ghana , Malawi and Rwanda . Present were crop breeders, seed producers, and representatives of agriculture-related businesses and non-governmental organizations. The meeting was jointly convened by the Alliance for a Green Revolution in Africa (AGRA) and the Ministry of Agriculture of Tanzania . AGRA , whose board is chaired by former United Nations Secretary-General Kofi A. Annan, has recently awarded a total three grants, totalling US$553,692 to cassava breeders at national agricultural research organizations in Kenya , Malawi , and Tanzania . AGRA has also made a grant for $157,500 to support rapid distribution of four cassava varieties that are resistant to CBSD on the islands of Zanzibar and Pemba . If CBSD continues to spread unabated, the damage would be considerable, breeders said, and would compound the losses already being caused by a second disease, the African cassava mosaic virus. CBSD causes the normally edible cassava roots to become corky and inedible, and may also streak and destroy leaf tissue. 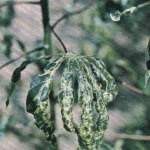 Once introduced into a field, the virus can spread rapidly, and yield losses of up to 100 percent have been registered. However, Tanzania ’s cassava breeders have developed tolerant materials that could be critical to arresting the epidemic. The key will be getting this genetic material to other breeding programmes in the region for use in local breeding programmes. Across Africa , cassava is a staple food for some 250 million Africans, and its tuberous root is the second most important crop in terms of calories consumed. It has served as a reserve against famine and is tolerant to water stress and poor soils, making it important to African farmers facing longer and more frequent droughts. Its leaves are used as a vegetable and provide a cheap but rich source of proteins, vitamins A, B and C, and other minerals. Cassava’s importance to Africa has even been recognized by the African Union’s New Partnership for Africa ’s Development (NEPAD), which has developed a Pan African Cassava Initiative (to do what?). Nonetheless, cassava remains susceptible to a number of crop diseases and pests, and most varieties grown by small-scale farmers are low yielding, limiting the crop’s potential to alleviate hunger and malnutrition.